Cynics needn’t fret, and purists of Michael Bond’s most famous contribution to British popular culture don’t need to panic: Hollywood has been fairly kind to Paddington Bear. Despite the endless controversy from the departure of Colin Firth as the voice of the titular CG creation to the BBFC’s decision to award it a PG certificate due to “sexual references” (the horror! ), writer-director Paul King and producer David Heyman have come out of the storm completely dry and delivered a family film warm on heart, laughter and, of course, family. Endlessly enjoyable from start to finish, King has expanded on Bond’s story and characters in ways that feel updated without losing sight of how Bond originally envisioned them. Such an extension now lends us a brief prologue set within the jungles of Darkest Peru, where we first meet our furry hero (now voiced by Ben Whishaw) living a peaceful existence with his marmalade-loving aunt and uncle (voiced by Imelda Staunton and Michael Gambon respectively), and how a tragic incident straight out of an early Disney movie sends him on his way to London. It’s all handled marvellously, with King – on his second feature after 2009’s Bunny and the Bull – bringing a unique visual style that Wes Anderson would surely be proud of. Speaking of which, there is a standout sequence that introduces us to the Brown family and their individual quirky habits one by one that feels as if it’s been lifted directly from The Royal Tenenbaums or even Moonrise Kingdom. Heartfelt homage, or uncomfortable rip-off? You’d have to be as miserable as next-door neighbour Mr. Curry (Peter Capaldi) to think the latter. Story-wise, it takes on the “fish out of water” scenario that Bond originally wrote about – a Peruvian bear interacting with our contemporary culture – and has subsequently been used in many family films over a number of years, but although it isn’t redefined with this film it is still fun to watch everything take place. This reviewer has often felt that clichés can be tolerable if the execution is right, and how King presents his film is so heartfelt and passionate that it doesn’t matter if we’ve seen it over and over again, we’re just enjoying watching these events unfold. Though the original core of Bond’s stories remains in place, the more filmic sub-plot sees Paddington become the target for Nicole Kidman’s unsubtly evil taxidermist (think Cruella de Vil if she were a Hitchcock blonde), which takes up the spotlight for a surprisingly-action heavy third act. It’s understandable why they had to include this new angle for the film; in the books, aside from Mr. Curry and his unpleasant attitude, Paddington had no real threat against him. It usually consisted of Paddington just causing trouble and coming out of it with a smile on his face, no real consequences shown. The rules have changed now that it’s a three-act feature film; it simply wouldn’t work if they had stuck entirely to Bond’s formula, so things need to be spiced up and thus we have a fully formed movie villain that’s perfect for younger audience members to be frightened of, and decent enough for older viewers to be at the very least entertained by. What makes this movie the most strong, however, is its attention and focus on character. That sequence mentioned earlier which helps us to know the Brown family a little better is wonderful because it puts them and their interests in full focus, and as such they become more three-dimensional rather than the typical family archetypes we’ve seen in many forms of media before it. Smaller characters such as Jim Broadbent’s antique shopkeeper Mr. Gruber, who sadly makes a small appearance in this film (though if we get a deserved sequel, he’s sure to be more of a presence), are given hard-hitting backstories involving their experiences as a child refugee during the Second World War and once more seem believable and rounded. Even the villains of the piece, more so Kidman than Capaldi, have pasts and little stories of their own to try and justify their evil personas in the present. As for Paddington himself, he is a walking bundle of CG joy, created lovingly by the visual effects team at Framestore – the Oscar-winning effects studio behind Gravity, another Heyman-produced film – and, most importantly, voiced perfectly by Whishaw. With due respect to Firth, the Skyfall actor has the richer and more youthful vocal chords needed to bring the bear to life, and his Paddington is a delight to listen in his innocence and kind-heartedness that takes him very far into the well-beings of audiences. But King doesn’t stop there: there are some great gags to be found that call back to his earlier days with The Mighty Boosh, and an energetic calypso soundtrack with a live band that calls back to, of all things, There’s Something About Mary. It’s a perfect family film that all ages can truly enjoy without any guilt whatsoever, and has the heart and visual splendour to last for a very long time in the eyes of its younger target audience. In the absence of an actual Pixar film this year, Paddington may yet be the closest we’ll get all year to getting one; not to mention another great Wes Anderson film and, most importantly, a film that Michael Bond and the bear’s many fans can cherish for a lifetime. 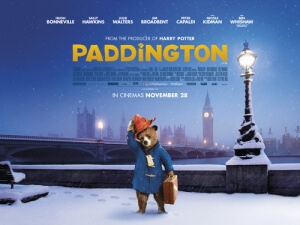 Paddington is a wonderful family film that can inspire genuine delight in all ages, thanks to Paul King’s unique visuals and direction, the many moments of laughter and tears (mainly the former) and some joyful development for a cast of rounded and likable characters. Highly recommended for all children, and all adults who want to feel like children again.